Ben joined Best & Sharp after graduating with honors from the University Of Tulsa College Of Law in 2009. He was named a Junior Partner in January 2014 and elected as a Shareholder in January 2016. 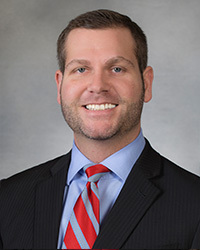 Ben devotes the majority of his practice to litigation and trial advocacy, primarily in the areas of medical malpractice defense, trucking litigation, personal injury litigation, and complex civil litigation. Mr. Reed is a Tulsa native. He graduated from Booker T. Washington High School in 2000. He and his wife Casey have 3 children, Maverick, Jagger, and Rainey. In his spare time, Mr. Reed enjoys coaching his kids’ youth soccer and basketball teams and relaxing with friends and family. Recognized by Oklahoma Super Lawyers as a ‘Rising Star’ for 2014 and 2015. Reed BD, The Rise of ‘Good Samaritan’ Statutes, National Association of Legal Professionals @Law, Spring 2010; 58(4), 26-29.